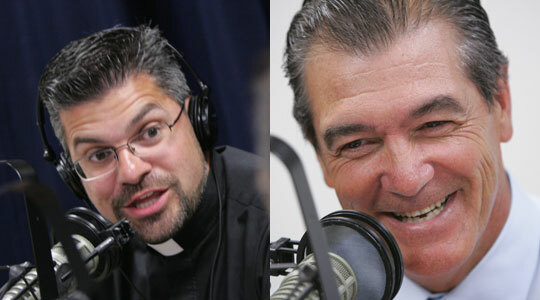 Summary of today’s show: Artie Boyle, a father of 13, tells Scot and Fr. Matt how he was diagnosed with cancer at age 44, how it drove him to prayer and deeper faith, and how he came to travel to a little town in the Balkans called Medjugorje where the Blessed Mother is said to have been appearing to six people since the 1980s where he sought both physical and spiritual healing. 1st segment: Scot said this is a two-part series with Artie Boyle. SCot told Fr. Matt that they’d left off the day before with Artie coming down the mountain in Medjugorje convinced that he was healed of the cancer he’d been diagnosed with. Fr. Matt is reminded of the story in the Gospel of the healing of the paralytic. The paralytic’s friends tore open the roof and lowered the man down to Jesus. When Jesus saw the faith of the man and his friends, he told the man his sins were forgiven and then healed. Fr. Matt said Artie’s wife, Judy, and friends, Kevin and Robbie, are like a trinity who were praying with him and for him. Artie said the paralytic man’s story is close to him because he believes he would not have been healed had Kevin and Robbie not decided to drop everything and go to Medjugorje with him. Kevin runs the largest HVAC company in New England and Robbie is the president of a huge commercial real-estate company. They are very busy men and they dropped everything in an instant to take their friend to Medjugorje. Scot said they had faith that if they took Artie there, that he would be healed. As the trip went on, Artie learned many things to come back and teach others. He knows many people don’t receive physical healing, although they receive spiritual healing. When he came off the mountain, they went to Apparition Hill, the place where the visionaries first saw the Blessed Mother. It was dark by now and when he got to the top of the hill, he laid down prostrate on the ground, looking up at the stars, praying, and in a state of peace. He believes that after confession, he didn’t sin at all for the next couple of days, which he knows is almost impossible for him. Laying there, looking up at God, Artie asked God to take him now because he was ready. Later, their guide took them to meet Fr. Jozo, who was the original pastor of Medjugorje. He didn’t believe the visionaries at first, but the Blessed Mother later appeared to him as well and he became the protector of the children against the Communist regime. He was jailed for 18 months. As they were getting ready to leave they saw that Fr. Ed McDonough happened to be there at the same time. Fr. McDonough had had an accident and Artie and Robbie ended up taking him to a hospital and they never got Nancy’s address. His parents had just divorced after 44 years of marriage, but he’d never told her that. He burst into tears even though he’d never realized he need to forgive. He learned two valuable lessons in Medjugorje. First, he learned that God wants all of us to be well and to be healed. In order for us to be healed, we need to be an open vessel for the Holy Spirit to come in and the only way we can do that is by going to confession and by forgiving everybody and anybody, to hold nothing back. Sometimes we need to pray for the grace to know what we need to forgive. The men were ready to leave Medjugorje at this point. His wife, Judy, was at a cookout with Fr. Arthur Calter, one of the priests from his parish. As Judy got up to leave, they asked her where she was going. She said, “I have to go pickup my husband. He was just healed in Medjugorje.” The three wives picked them up at the airport and they were heading out to see a priest who was going to pray over them. Before they left, Artie had seen the miracle of sun, which is a phenomenon in which the sun appears to dance in the sky. They wanted to see the miracle here in Boston, so they decided to stop the car and pray the rosary. Their wives felt bad for them because they thought they were going to be disappointed. As the men prayed, they all saw the miracle. This has happened many times since then in many places. Artie saw it as a way to share the experience with their wives. Artie had asked his entire family to be present when he got home, including his parents and siblings and all their kids. He brought his father in front oft he whole family and forgave him for divorcing their mother. His mother wasn’t happy with it and he felt like he was called to do this in a public way. Two days later, he went in for a CT scan and they told him he wasn’t breathing right and he got excited. He went back to the Mass. General and went up to the surgeon with the films. Normally when the doctor calls you in to deliver bad news, he’s sitting behind the desk. This time, the doctor was standing on the threshold, and told him that the tumors were gone. The large tumor disappeared and the other two had shrunk to insignificant size. The thoracic surgeon, the urologist, and the oncologist all got together and on September 14, the feast of the triumph of the cross, instead of having his right lung cut out, he was playing golf with his friend, Kevin. Artie believes that those two little nodules are reminders. He prays more and more fervently and with more understanding now. Since then, Artie has met Ivan Dragicevic, one of the six visionaries of Medjugorje at a prayer meeting at St. John’s in Quincy. Artie tried to get to know him, but Ivan left first. Artie’s story appeared on the front-page of the Boston Globe on Christmas Day. Ivan then called the house and invited Artie to be present during one of his apparitions and they have since become very close. One or two years later, they were able to remove the remaining nodules [laparoscopically])http://en.wikipedia.org/wiki/Laparoscopic_surgery), instead of having to remove his lung in the surgery. Ivan told him that the Blessed Mother would be in the operating room with him and that Jesus’s hands would be the hands of the surgeon. He had the surgery done and it went without a glitch. The tumors were found to be renal cancer cells, which should have been growing, but had done nothing in all that time. As of his last tests, Artie’s right lung looks perfectly normal and healthy. Jesus had continued to heal him and he has had zero evidence of cancer in his body. He hasn’t been back in many years because he told his oncologist that Jesus healed so he didn’t need the tests. The oncologist told him he’s right, that the barium and other materials involved in the tests were probably doing more harm to him, and told him he’d “graduated from the school of oncology” and very few people ever do. 2nd segment: Scot said many people don’t receive the same kind of healing that Artie did. He asked Artie why he thinks so many don’t receive physical healings even they pray for it. Why did God choose Artie? Artie said he may never know why God chose to heal him physically. In Medjugorje, one of the messages of the apparitions asks people to start prayer groups, and so they have a prayer group that meets every Thursday night at St. Paul’s in Hingham at 7:15pm. The purpose was to pray the rosary and the chaplet of Divine Mercy. They will sometimes have the celebration of Mass. It is a rosary of people asking God for something, whether physical healing or other assistance, but through their prayer many people are made ready to come before God. They have seen thousands of people who have been healed, as well. Artie believes he’s been healed not just to convey the message of forgiveness and confession to the world (because he’s made a promise to speak wherever and whenever he’s been asked), but also to lead others to prayer. The healing wasn’t just for Artie, but to tell people that Jesus is active today healing people. He’s preaching always and sometimes uses words. He has a large family and they know that people are always looking at them, wondering how they do it, so he knows they have to be a good example. Fr. Matt says through the prayer group they are pointing people toward heaven, which has always been the Blessed Mother’s message at every apparition. Our decisions on this earth have eternal consequences. In the midst of people’s hardships, God has raised up Artie’s family to show that while no one ever wants suffering, it ultimately points to the God who can heal and wants us to be with him in heaven forever where there is no more tears. While we want to pray for healing, we need to pray for healing of the soul as well. The inward healing has an effect on the physical well-being because we are both body and soul. Artie said Jesus used his own body to heal him. He believes that in Medjugorje that he entered such a state of peace and prayer that his immune system rebooted itself and killed the cancer. That never would have happened had he not been praying and been in a state of peace. You can’t know God if you’re constantly on the go and receiving constant stimulation. Fr. Matt reminded Artie that he said he used to be afraid of Jesus. How did he go from there to Jesus being his brother, friend, and savior. Artie said as a kid there was always an image of Jesus being rough and tough and mean toward sin, while the Blessed Mother was always loving. But through hearing about Jesus in the confessional, reading Scripture, and prayer, he has been drawn much closer to Jesus. Scot said the practice of confession throughout the Church is not what it used to be. What has Artie learned about confession? Artie said outside of Mass, confession is the most powerful sacrament. You have to find a priest you’re comfortable with and you can have a heart-to-heart conversation with him. He has the wisdom and understanding of Jesus Christ through the sacrament. He often goes to St. Anthony Shrine in Boston where confession starts at 6:30am. Scot often goes before work because it’s easy to find a place to park at that time of the day. Artie used to go during the workday and was amazed at how many people would go. Part of that experience is grace, which you can never get through going to a therapist. A lot of the priests at the shrine can give get great advice, but its the grace that is most important. Artie said in Medjugorje priests can be found hearing confessions everywhere, not just in the church, because the demand is so great. Fr. Matt said Our Lady comes as Queen of Peace, helping us find peace not just in the world, but in our families and our lives. We don’t have peace because we’ve shut God out and confession lets him back in. Confession opens the door to the closet of skeletons we shut years ago and cleans it out. Then after we’ve been forgiven, then we have to forgive those we hold grudges against. Fr. Matt said many people don’t realize that anger and unforgiveness is a spiritual cancer. Artie said a friend was sick with cancer and he told his story to him and he went to confession. A couple of weeks before he died, Artie was with him and the phone rang. The friend looked at the caller ID and threw the phone on the bed in disgust. He said it was his father and he didn’t want to talk to him. Artie said don’t you understand after everything I’ve said that you need to forgive him, but he never did. He died a very painful death. Scot recalled that Artie said after feeling the physical healing in Medjugorje that he also felt free of sin. Artie said it was the most incredible feeling he’ll ever have and hasn’t experienced it since. It’s even more than being in love and having 13 kids. It gave him a glimpse of what heaven must be like. He wanted to thank Jesus so much, that he just continued to pray and pray. Our Lady says, Pray until pray becomes joy. If you want to get better at prayer, pray more. Scot said perhaps people find prayer boring because they don’t pray from the heart. When Artie first went to Mission Church for a healing Mass, he was desperate. He gave himself over to God. There was no “Why me?” and no animosity, just trust in God. He talked to God as a friend in the same sort of language you’d use with a close friend. Fr. Matt noted Artie called himself a convenient Catholic before his diagnosis, one who went to Mass on Sundays as a duty. He asked how often we say the Apostle’s Creed or other prayers of the Mass and don’t reflect on the words we are praying. Do we really intend the words we are saying. Fr. Matt said it’s important to go to Mass early. If we go to a Patriots’ game, we go three hours early to tailgate and get filled with the “spirits.” We talk about the game and the players and what we expect. We become mentally prepared to enter the football game. But when it comes to Mass, we show up late, we’re not prepared, and we’re rushed. Fr. Matt said he often needs time to transition from one thing to another. That’s why getting to Mass even five minutes early, so you can sit with God and ask what you need to pray for and to put yourself in the presence of God. Scot asked how many kids would show up for their child’s First Communion five minutes late. No, they’d be prepared, they’d show up early, they’d invite family, they’d bu ya new suit or dress for the child. But it’s the same Jesus they will receive at the second, third, and subsequent Communions. He often thinks about how he should go to Mass as if it’s his first Mass, his only Mass, and last Mass. We’re not called to be spectators at church. We’re called to pray every prayer with intensity. Artie said most people don’t recognize the great gift of Mass. We shouldn’t look at it as just an obligation. When he speaks with Ivan, they pray two mysteries of the rosary, they have Mass, then Ivan speaks and Artie speaks. It’s four hours long and people leave filled with the Holy Spirit. But people leave Sunday Mass upset if it’s more than 45 minutes. The reason is because people aren’t spending enough time there. 3rd segment: Scot asked Artie what he physically experienced when he forgave his parents. In the confessional, he experienced pure joy. When he forgave his father, he gave forgave all the anger and angst he’d been feeling inside because of it. When we’re holding on to a grudge, we’re hurting ourselves and keeping ourselves from Jesus. When they were first married, Artie and Judy would argue, but Judy decided to stop telling him what to do and instead to pray. They both changed through the prayer and that’s a form of forgiveness. Scot said we all want forgiveness from God, but recall that Our Father joins together “forgive us our trespasses” with “as we forgive those who trespass against us.” Fr. Matt said forgiveness brings peace and joy. The opposite is true as well. Scot said there active apparitions and healings in Medjugorje going on now, but the Church’s relationship to Medjugorje is different than those with Fatima or Lourdes. He asked Artie and Fr. Matt to reflect on how we’re to respond to stories about it. Fr. Matt said a commission created by the Vatican is still investigating the legitimacy of the apparitions. There have been different quotes that have been attributed to Pope John Paul II and Pope Benedict XVI that have been positive. There has not been formal approval, because that can only come after the apparitions end to ensure that they are all compatible with faith and morals. The Church doesn’t say we are prohibited from visiting there. Dioceses and parishes are not supposed to sponsor official pilgrimages there because of the potential of confusion. But private pilgrimages can have priests accompany them to provide the sacraments.